Jakob Dylan, The Wallflowers "When You're On Top"
'Twas the last week of September, and a BFH ("Big Fat High") was coming through Colorado, so it was a good weekend to head to the mountains, check out some of the foliage, and climb something high. 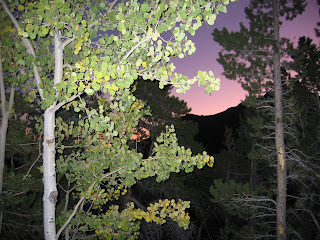 So, at oh-dark-30 (actually, 2:45AM) Saturday morning, we headed up to the Sawatch for the 3rd time this year to hiking sumpin' fun: Brown's Peak and Huron Peak. 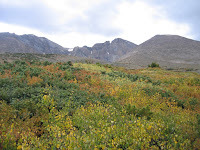 Huron Peak is an easy 14er, with gorgeous views of numerous other 14ers and no paved roads. The standard trail is a class 1 walkup, around 2 miles from a high 4WD trailhead, and can get crowded in the summer. But that wouldn't be very interesting, would it? 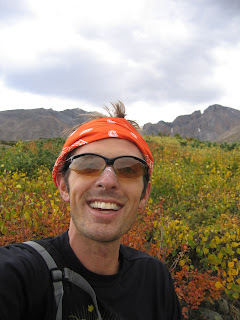 Instead, our plan was to ascend via Lulu Gulch, climbing Browns Peak along the way. The drive out was uneventful: the sky was perfectly clear, and the low over Fremont pass was 24 degrees(!). We arrived at the South Winfield trailhead with just a tiny hint of dawn, and 30 degrees, but the day would get warmer as soon as the sun started clearing the mountains to the east. There was only one other car at the trailhead, a big change over the summer. We took our time getting ready, eating breakfast burritos, and generally allowing the sky to lighten, which saves headlamp weight and space (more burrito room) and wards off bears and lions (according to Jess). This spur 4WD road continued long switchbacks until treeline, when Lulu Gulch and the Cirque from Middle Mountain to Brown's Peak was in view. At this point, we were to leave the road and find our own route up to the ridge along Brown's. Jessica picked our ascent route, a mixture of scree and tundra. As we were in the shaded, west-facing aspects that still hadn't seen sunlight yet, the ground was still partly frozen. Rather than being icy, however, it kept it from being loose, so it was quite pleasant to ascend this route in this weather. Full disclosure: Up until now, we couldn't even see Huron. 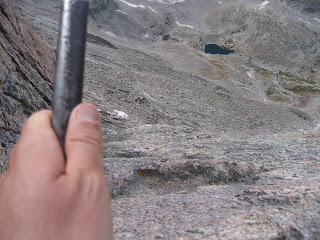 Before this, in fact, I was arguing with myself as to where the hell Huron was, and after all this work, Jess didn't seem amenable to the mountain in front of us (Brown's) being a 'false' summit (if a separate 13er can really be a false summit). Well, either way, we had to make it up to Brown's, and then we could discuss further plans. We made it to the top of Browns and had it to ourselves. There was a sparse summit register there -- one or 2 signatures per week during the summer -- and gorgeous views all around. Did I mention we hadn't seen a soul yet all day? Well, at this point, we could finally see Huron, as well as a few folks on top of it. This route was worth it not just for fun scrambling, not just for solitude, but also the sweet perspective of Huron that we'd miss from the standard CFI trail. To get there, we had about half a mile to go, with about half of that scrambling over the snow-dusted ridge, before joining with the standard trail for the final summit push. From this vantage point, covered in snow, Huron actually looked kind of gnarly, even given its easy reputation. Jess didn't like the looks of it, as the obvious trail was a ribbon of snow that seemed to go straight up. Either way, though, we needed to proceed to the saddle between Brown's and Huron, join with the standard trail, and then make our decision. As we moved toward Huron, we took a cautious route to the right/below the top of the ridge. The snow was only a few inches deep, but slowed us down a bit. As we rounded a corner, with Jess slightly out of view, I heard a loud thunk that made my heart skip a beat. It turns out, Jess leaned on a decent-sized boulder at shoulder level, and it actually rolled out toward her! She got out of the way in time, but bruised her left hand in the process. This was especially unfortunate as we continued traversing the right side of the ridge; i.e., the left hand was frequently needed for balance. She shook it off admirably and kept at it, as we proceeded through the boulders to a flat spot where we could intersect the standard trail. And that's when I did the stupidest thing I've done on a mountain. A pure stupid, stupid rookie mistake. I watched it, entranced, willing it to stop, as it would slow down near a rock, then roll around it, and start picking up speed. It crossed the trail twice, and started getting near another hiker. I was preparing to call it out in warning, when it finally, mercifully, stopped. The hiker (a friendly German ex-pat) retrieved it for me, as I cruised down past Jess to meet him. I turned around and met back up with Jess -- I will admit to enjoying a bit of extra-credit heart-pounding descent and re-ascent -- right as the switchbacks ended, and the snowy ascent began. This would have been a good time for Yak-trax or the like -- the very same ones we were looking at in the store the day before, perhaps -- but it was still manageable with some scrambling (on what would normally be a walk), aiming for one rock at a time. We were uncertain of the downhill awaiting us, as we watched one guy biff a few times as he descended. We were greeted by 2 women (first 14er for Mom), a dog, and perfectly blue skies. After taking our picture, the ladies left and we had the peak to ourselves for a few minutes -- quite a difference over the summer, I imagine. Jess's mood improved, and she seemed genuinely happy on her 2nd summit of the day. Here, I must add that it was 2 days before our 7th anniversary, and I could not be happier sharing such a beautiful day with the person I love most in the world. Soon, the German gentleman and his partner arrived, and we exchanged pleasantries. We took some more pictures; ate some breakfast burrito and zucchini bread; and I fired off a cryptic text to my brother-in-law. Then, we began the snowy descent down the standard trail. We passed maybe 4 or 5 folks coming up -- man, it was such a gorgeous day! -- and the snow soon gave way to mud. The views in the valley at the bottom were also spectacular, we were quite pleased with our choice of a loop route. Now, we did have a bit of schedule in getting back down. We weren't rushed, but if we had no commitments, I would have loved to take a nap out in the meadow. That's how gorgeous and non-threatening this September day was. Alas, we trudged on down a million switchbacks on the standard trail, until finally intersecting with the 4WD road. and headed back home, about 8.5 hours since we started. I would estimate the snow slowed us down by approximately an hour. In summary, the Lulu Gulch route is a fabulous alternative to the standard route on Huron. I would consider it equally fun for ascending or descending when doing a loop with the standard route. 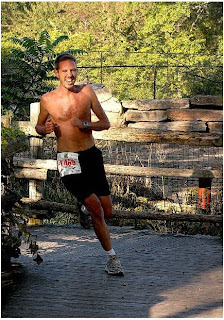 The weather looked great, and glancing at the calendar, we noticed a 4-mile race at the KC zoo. Sounds like fun! This was the 6th year of the "Kansas City Zoo Run" race, with each year highlighting a different endangered species. This year was chimps, and it sounded like a fun way to see the zoo. Plus, while generally weary of too much mixing of charity and running, this mix seemed like a sensible way for the zoo to offer it's assets (well-maintained roads, beautiful landscaping, and a fabulous volunteer and work staff) for charitable purposes. And...a cool t-shirt! Well, sort of. They ran out on race morning, which might testify to either lack of preparation, or overwhelming demand -- but in either case, the shirts are (still) in the mail. The logo was designed by a 6th-grade student, who was honored after the race -- fantastic! So, the race itself...I won't bore you too much with turn-by-turn age group competition reporting, but I will briefly describe the race itself, should you ever find yourself in the area. OK, a little personal background: I set a goal of < 25 minutes, with the idea being close to 6 minute splits as possible. This timing will give you an idea of the course difficulty, or at least my perception. I hadn't run any sort of speedwork since July, so I quickly did a couple workouts the previous week just to make sure I remembered how to run < 6 min miles! Anyway, the front of the race had some singlet-wearing high school and college racers, both from the KC area as well as Lawrence. Other than that, the crowd was quite large, with people of all ages and sizes, a good vibe in general. But not too aggressive. The funny thing about a 4-mile race is trying not to blow up after 3.11 miles that many people are used too. I was still feeling relaxed, though, and ended up passing some folks. The last turn and I could see the finish line, as well as the top female. I had a bit of a kick left but was still a good distance behind her (a talented KU runner), and ended up...where I ended up. In the arbitrary nature of age groups and such, I ended up winning a token chimp award for my efforts, which I do appreciate as a keepsake. So, if you're in Kansas City in mid-September, keep the zoo race in mind! * McCoy's Brewpub patio in downtown KC (by the Plaza) had great food (broccoli mac 'n cheese! ), beer (award-winning brown ale) and atmosphere. which is one of my favorite styles. This one was excellent, and I dig the graphic art job. I also dug the atmosphere and cool merchandise. Finally, our food was awesome, and I think anything would go well with their sunflower pesto. Local, I love it. And so it was, in the pre-dawn, post-summer darkness of September 10th. Soon -- within weeks, perhaps -- the trees outside my balcony would sacrifice their leaves, and their naked outline would once again reveal a long winter's view of the highest Front Range peak. If I didn't climb it now, I would face another three seasons of uncertainty and anxiety at best, and regret at not taking advantage of health and opportunity. (In truth, I had no choice, for though I had been thinking about it the past two summers, this was the first year I said something out loud. Now that it was out there, documented and committed, it was a matter of working out the details and waiting for good weather). 1. This would be my first time up Longs. The advantage of this would be to combine the excitement of the virgin experience with the purity of a carbonless commute. Whoa. Actually, I was also concerned that hiking the mountain a previous time would diminish my enthusiasm at doing it again anytime soon. I debated this point internally, since previous experience on this route would be safer and allow me to do it faster, but ultimately I'm glad that it was my first time. 2. No pre-arranged outside support, though I'm OK with stopping at known/expect public supply areas, whether it's filtering water and picking huckleberries or buying food from 7/11. The point (to me) being, doing what I'd do on a car trip, only on a bike instead, without meeting someone in a car that carried gear and sort of negated the whole car-free thing. All of these points worked out fantastically. I debated a leaving time considerably, and eventually decided on leaving between 1:30 and 2AM. Regrettably, I only had a couple hours of fitful sleep before leaving my house at 1:50AM. A few comments on gear. First, a duathlon adds a fair amount of weight to required supplies, obviously, so anything you can strap to your bike is helpful. I was overly cautious by taking an extra warm layer and emergency bivvy -- knowing that the weather forecast was favorable, I could have skipped these and saved a decent amount of room in my pack and been able to run more/hike faster, but I played it safe. Also, a mt. bike would be more comfortable in some respects but slower -- a touring bike with racks/panniers would have been ideal. Finally, I bought a bike light at the last minute: due to the 1/2 moon, I could have done it on headlamp alone, but it was nice for some faster descents and corners in the dark canyons. It only had a 3 hour run time, so I rationed it accordingly. It was dark, it was calm, it was quiet. 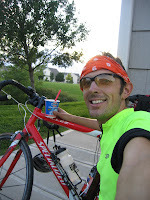 I made my way out of Fort Collins on my favorite back roads, past Boyd Lake, down toward Eisenhower/Hwy 34 in Loveland. Normally, I avoid riding on 34 until the west end of town, but at the wee hours, I welcomed the street lights and wide lanes. I was slightly nervous about being sufficiently visible, as well as drunk drivers, cell phone drivers ("Let me talk on my phone while driving to stay awake, that's always a good idea") or being an easier target of harrassment, but the opposite was true: every car that passed me gave wide berth and no honking. So far, so good. I anxiously made it out of Loveland and into the Big T canyon; here, I felt like the adventure was truly beginning, as I left the city lights behind. I was wearing shorts and long sleaves, and expected the canyon to get cooler, but was pleasantly surprised to find it warmer. I kept a slow, steady, unknown pace -- my bike computer sensor was off a bit and I hadn't stopped to fix it. Not that I had extra energy to carry the excess pack weight, but I was also conscious to ride the hills slower than I normally do, as I absolutely needed to save my legs for the height. As I got deeper into the canyon, I enjoyed the quiet solitude and muffled sounds of the river, the cool and slightly damp air, and occasional reflections of yellow eyes near the ground. The moon was high in the sky behind me, helping guide the way, along with a bevy of stars I don't normally see at home. Then, straight out of a cliche, a shooting star streaked just above my head and dropped deep into the horizon. At that moment, I resolved to do more general night riding in the future, without any particular destination. The parking lot was full, and a few folks had begun setting off when I arrived, so I knew there would be company on the trail immediately. I was a bit behind my anticipated schedule but still had margin and felt strong as I changed into my trail shoes and adjusted my gear. I locked my bike to the fence, along with my small pack with bike supplies and a half bottle of water for the return, and signed into the register around 6:40AM, right after full sunrise. My legs weren't up for running immediately, so I did a fast/comfortable hike and only ran occasionally on flatter areas. Soon, I began catching up to others. 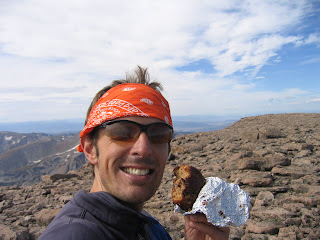 There's not much more I can add about the East Longs Peak Trail. It's varied, gorgeous, and worth an out-and-back of any distance. Based on trail signs, it looks like I was hitting ~17 minute miles, which was slightly better than my conservative estimate of 20 minutes. This meant my estimate of hitting the boulderfield in 2 hours was reasonable. The folks I encountered were pleasant, cheery, and graciously let me pass. 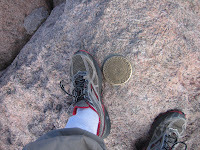 I slowed down a bit as the trail got rockier near the boulderfield, and eventually reached it about 1:45 after starting. I counted 26 people as I passed by, and now I felt more comfortable about not being "last" on the trail. There were more folks making their way through the boulderfield, and about a half dozen tents. While it's a beautiful area, I can't say I'd feel comfortable sleeping there: it can get windy, it's not very private, and it's definitely exposed. On my way up to the Keyhole, I saw a young woman with a Boston Marathon jacket, so I greeted her with a "Hey, Boston Marathon!" She returned a curiously reluctant smile. We talked briefly about Boston -- "The best day of her life!" -- and I was quite happy to relive a beautiful experience like that in such a beautiful area. Soon, I learned about her hesitation, however. They made it to the Keyhole, but the heights and exposure were too much for herself, mother, and father. A few more of her party (from Connecticut) had continued on, including her husband. Her father made it a bit farther on the ledges before turning back at the exposed spot where two iron bars are hammered into the otherwise smooth and slippery rock. Crap. I haven't particularly had problems with exposure or heights on previous hikes, but I have had a healthy dread of this part of the hike, based on stories and pictures with distorted perception. And what if it rains? Hails? Graupels? What if I'm extra tired or dizzy from the bike ride? What if it gets crowded in some narrow spots? And so on. I should also mention, since going through the keyhole turns the route in a new direction: no wind. DFC. Awesome. 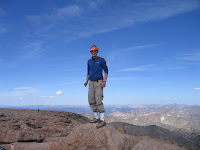 I met another young man who just moved to Denver and was climbing his first 14ers before starting work in October. He was traveling very light and asked if I was thinking about the Denver Marathon next month ("Probably not, it's coming up quickly!"). 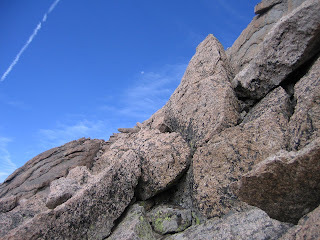 He asked what the crux was, I told him that it was, supposedly, the chockstone at the top of the trough. He said we could do the ledges together, but I didn't want to hold him back. I won't lie and say it was "easy", but I do feel like it was much more manageable than I had feared. Part of my continued anxiety was the unknown parts that lie ahead, the weather uncertainty, and having to do everything twice. After everything, however, I will suggest this: as far as exposure, the spot with the bars just past the Keyhole is as bad as it gets. If you make it past that, you'll be fine, so that's the point you'll know how you feel about exposure for the rest of the route. After having done it again on the return trip, now it's not bad at all. It's just hard to find unbiased, non-polarized views of the ledges: either people turn around in terror, or they do it and say "piece of cake" as they forget about how they felt the first time. If you take it slow, focus inward toward the solid rock, and your heart rate/breathing is OK, you'll be fine. Not much to add on the rest, as thousands of others have written about this route, but it wasn't too crowded at all, and I enjoyed the brief company when encountering others. I passed a young couple from Indiana who were smiling but taking a break, as the girl was a bit dizzy. She thanked her mate for carrying all their gear in his pack alone, I jokingly asked if he wouldn't mind carrying my stuff too. "He would do it, he's such a sweetheart!" she gushed. Her enthusiasm and loving gaze toward him was inspiring. There is a V-slot which can be tricky but was quite fun, and it felt like there were solid holds in just the right spots. The trough is the long slog as advertised, and I was glad to be there on a non-busy day. Still, a guy ahead of me kicked up a small rock, he called it as I was watching him anyway and we both were entranced watching it plink towards me before skipping sideways, though I had plenty of room to duck. I smiled back, if that was the worst that could happen! The chockstone at the top was not only manageable but fun. Next up were the Narrows, also advertised as having exposure, but I found this area to be more solid than the ledges and quite enjoyable. As I turned toward the Homestretch and stepped up around the corner, though, I bumped my head lightly on a rock to the left ("Stupid!") I saw a party just around the corner, one guy sitting down. "Yeah, I hit my head..."
"Just there, on the corner?" He shook it off and continued on. There were about 8 others on top, including one gentleman celebrating with a joint, who signed "Dank 420" in the log. I had my own celebration, with banana bread! I stood on the summit rock, and unwittingly posed for the dorkiest summit photo ever, since I forgot my pants were still tucked into my socks. I signed the summit register and mentioned "Biked from Ft Collins!" Another group saw that and then said, "Oh, we saw you in the canyon this morning!" I lingered for about half an hour, and it seemed like everybody found their own quiet spot on the summit. I met a group from Nebraska that had pounding headaches but good spirits. The Connecticut group said they've debated on what's harder, a climb like this or a marathon: I remained non-committal. The clouds remained unthreatening; I was able to text the wife and brother-in-law; and headed back down at 11AM. I slathered on more sunscreen on my nose, but failed to rub it all in, hopefully amusing the numerous people I saw in the next few hours that neglected to point this out. I am a cautious and slow descender, and crab-walked much of the homestretch. Still, it wasn't crowded by any means, though folks were still headed up. Like I mentioned, pretty much everyone I encountered was cool. One strong hiker called another woman "Mom" -- I said how cool it was, that she was able to do it and they were able to do it together. "This is my first time hiking this again in 31 years. I'm celebrating my 67th birthday by doing it again!" Descending around the chockstone above the trough ended up being a bit tougher, so I went skiers-right along a ledge and grabbed onto the lip of another rock. Here was the first (and only) time I encountered an annoying hiking stereotype: a type-A woman with blond highlights, still ascending with a group, asking if they were the "last ones" headed up -- obviously concerned at making slower progress than she anticipated. She didn't have the calm, mellow demeanor that everybody else seemed to have. I can only imagine how much worse a weekend would be. Coming back to the Keyhole, I was slow and cautious, but still glowing from the summit stoke. I ran into some folks posing for pictures, and we figured out we were all Minnesota alumni. They had a tent in the boulderfield and graciously offered me water, but I declined. "No thanks, I have 2 more bottles in my pack." "Wow, that's impressive, you did great on your water!" This small statement was a meaningful compliment, as I was proud that my planning was still going well. "I do think a *hard* marathon like Boston, where you're going all-out the whole time, is harder than this hike"
Reflecting back, I'll elaborate: it's one thing to push your limits as hard as you can, and it's another thing to do something long but slowly and cautiously. There's room for both, and you'll miss out if you don't do some of each, as often as possible! A family from Houston was out for a dayhike, and I took their picture, as we agreed it was "Christmas-card-worthy" backdrop. Shortly after, I saw the couple from Indiana again, just as they met up with some dayhikers. They asked the dayhikers for extra water. I gave them the rest of mine as well. I felt for them, they had to turn around before the trough and didn't feel well, I had no idea they were low on water. This was their 3rd day in Colorado, and one of the well-meaning dayhikers said "That's good, it takes 3 days to acclimatize" but I corrected her to try to assure them, "It actually takes 6-8 weeks for the body to acclimatize fully" -- something people should keep in mind before getting too frustrated in comparing their efforts to "natives" (and natives should keep in mind when otherwise very fit flatlanders feel trashed)! I dropped into the trees, and, finally, got a good couple of miles running in. I just missed an 8-hour roundtrip by a couple minutes, but that was OK. I had the extra time budgeted, but had anticipated taking around 6 hours -- whoops! I signed out and got my bike ready, very happy to see that nothing was disturbed! (Thank you fellow hikers!) One guy from Lafayette saw me and asked where I biked from, he also saw me in the canyon and kept repeating how awesome that was. Next, a ranger came out -- I wasn't sure how they felt about locking to the fence, but he was jovial and asked where I rode from. He was impressed by Ft. Collins, and definitely encountered Boulder folks a few times a year, but not Ft. Collins. "That's a great thing you did, you should be proud!" I'm not generally comfortable with comments like this, but I'll admit to appreciating it. It's a tough line to walk between trying to be modest, and trying not to be labeled "crazy." Lots of people like to do some sort of physical exploits, just to consume it, often in some sort of competitive fashion, and call themselves "crazy." They might shuffle through a marathon just to check it off a list, then never run again, for example. I don't like to think of it that way at all, and it was refreshing not to see much of that on this Thursday on Longs Peak. I found plenty of inspiration from the mountains around me, and the folks along the way: people challenging themselves physically and mentally; families spending time together; generations passing along a love for the mountains from one to the next. For myself, I think of this trip more along the lines of picking something you love to do, anticipating it, getting ready, and going for it, enjoying every step along the way. It doesn't have to be physical, it can be devoting yourself to anything you enjoy. It doesn't matter if not a single soul knew anything about my trip, nor how long it took, but merely that I was able to do it, on my own terms, under my own power. On the path ahead, in the darkest and toughest of times, I will be able to return to the memory of this place. It is a feeling that is intensely private and personal, yet also universal. Doing what you love and what you can is not crazy -- wistful regret at not doing what you love is. All systems were great: tires held air, my urine was almost clear. Besides a mile or two on the highway, the rest was a lovely 35mph descent into Estes. Even though summer was over, throngs of tourists still infested the streets, consuming the mountains one knick-knack store after another. No matter, perhaps one boy would look up above the shops; perhaps one girl would see a reflection of Isabella Bird in a store window; and all would be right with the world. Cheese pizza by the slice(s) at "Chicago's Best"
Winding through town on the river path and filling up took up close to an hour, but everything was still going great. I wasn't tired, and I didn't have a headache! Now for the ride home. Usually, some sort of car/bike encounter ruins my otherwise blissful mood either in the canyon, or Loveland itself. But a few things were different today...First, most of the traffic was likely regular commuters -- a bit more skilled and familiar with sharing the road, I would think. But also, cars were noticeably swerving across double-yellows and giving plenty of room for me, my bike, and my mountainous glow. Could it be that drivers were adhering to the new 3-foot passing law, and taking advantage of legal passing across a yellow lane? It was so uncanny as car after car did this. I never understood why people didn't do this before it was legally allowed -- why not err on the side of caution for everyone than brushing past each other? -- but for some reason, the new explicit law might have made people actually think about it. So I made it to Ft. Collins, still no encounters with cars, and no mechanicals on the bike. I still cannot believe this good but simple fortune. Almost done...I decided a stop at Dairy Queen for a mint M&M blizzard was in order. I ate it while riding, no-handed, happy as a kid. Well, a kid of legal drinking age, because I also hadn't had a beer in a few days, and didn't have any in the house, so I stopped at the liquor store too. So yeah, 6 bottles of water, two packs, a blizzard, a bomber bottle of beer, and 17 hours later, I got back home! I anticipated 14 hours and it took 17, with no mechanicals or any problems. I had a fantastic time and met great people, it was a great time of year to go. I enjoyed every minute of it and fell in love with the mountain, I am eager to go back and try different routes. I hope some of this information is useful to somebody. Happy to provide any info on the following rides! These are the trails that I've enjoyed the most, so if you're thinking about one and recognize another, I can provide some comparisons if possible. All are mostly singletrack and doubletrack, unless noted.